Planning a Spring Baby Shower? Check Out These Spring-Inspired Baby Shower Favor Ideas. Having a baby shower in the spring opens you up to tons of great decor and baby favor options. 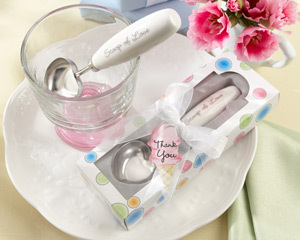 Here are some of our favorite spring-inspired baby shower favors. 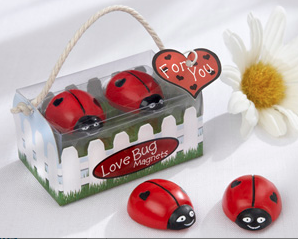 “Love Bug” Ladybug Magnets—Ladybug themes are always perfect for springtime, but these magnets really make perfect favor options for the spring season because they come packaged in pretty white picket fence boxes. 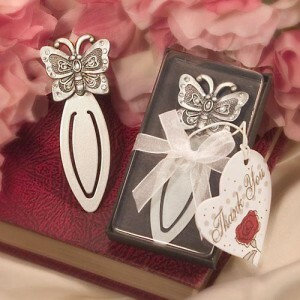 Two ladybug magnets sit perched inside the box, surrounded by the picket fence design that looks like it was made special just for a spring occasion. 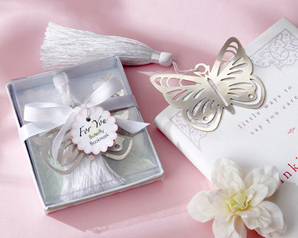 Butterfly Design Bookmarks—Butterflies and gardens represent the essence of springtime, and these butterfly bookmarks can bring that essence to your baby shower with a little extra style. You are bound to have shower guests who are readers, and this design is versatile enough to celebrate the life of a new baby boy or girl. 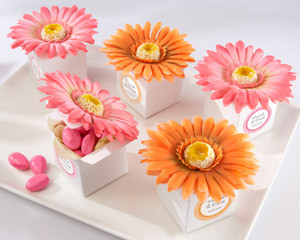 “Daisy Delight” Gerbera Daisy Favor Boxes—What’s springtime without daises? If you’re having a little girl, these baby favors are especially nice, but they can also work well for a boy or for a unisex shower. The colorful pinks, yellows, and oranges will really make your place settings pop, and you can fill the boxes with treats of your choice. 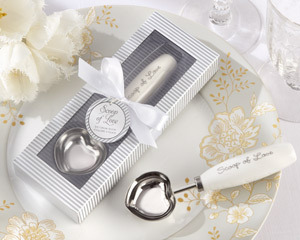 “Scoop of Love” Heart-Shaped Ice Cream Scoop in Parlor Gift Box—Everyone loves ice cream in the springtime, and these ice cream scoopers offer a nice decorative touch for a spring baby shower thanks to their packaging. These baby favor ideas are packaged in white presentation boxes with blue, pink, and green polka dot accents, so their pastels make them the perfect addition to any spring baby shower decor theme. This entry was posted in Affordable Baby Favors, Popular Baby Favors, Practical Baby Favors, Spring Baby Favors, Unique Baby Favors and tagged baby favor boxes, baby favor ideas, baby favors, baby shower favor ideas, baby shower favors, bookmark baby favors, practical baby favors, spring baby favor ideas, spring baby favors, summer baby favors, unique baby favors. Bookmark the permalink.